Love them or loathe them, Peeps are everywhere this time of year. Gritty to the taste, they are more than just “food.” They are perfect for crafts and decorating your table as well as your desserts. And best of all, they are cheap! (Or should I say, “cheep!”) Some of these suggestions are 100% legit, others are just for fun. Can you tell the difference? Does it matter? 1. Peeps-infused vodka. A friend of mine made this last year and it was simple and a big hit. Get the recipe from BakingBites.com. 2. Garnish a martini glass. Why use a boring, ordinary old lemon when you can use a brightly-colored Peep? 3. Float in a cup of hot cocoa. 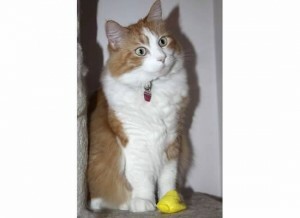 Instead of a marshmallow, substitute a Peeps chick or bunny. 4. 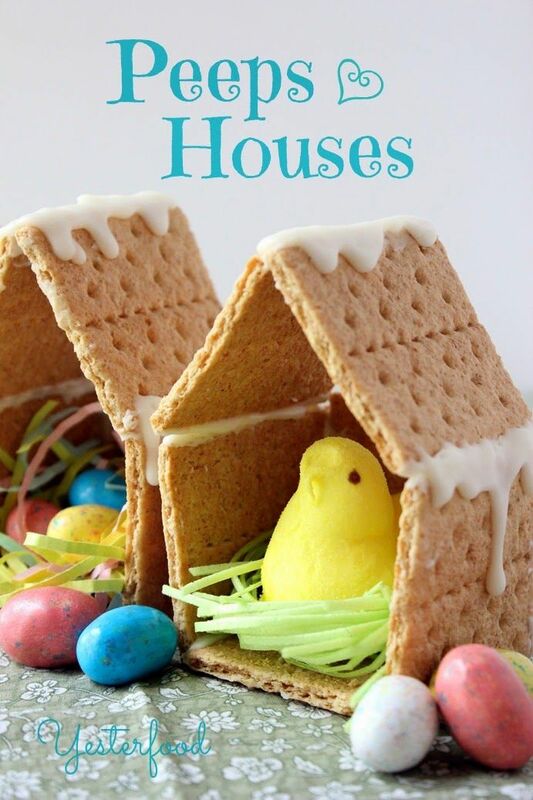 Make this adorable Peeps house. Kids on Spring Break and bored out of their minds? Get them “hopped up” and excited to make this cute and creative craft from Cupcakes and Crinoline. Sweet! 5. Top a cupcake. Turn an ordinary cupcake into something eggstra-special for Easter! 6. S’mores. Substitute an ordinary marshmallow with a Peep for an after-Easter dinner snack. 7. Put together a diorama. The Washington Post has published the rules and guidelines for its 9th Annual Peeps Diorama Contest. The grand prize winner, as voted by staff, will receive a $200 American Express gift card. Four runner-up winners will receive a $75 American Express gift card. Get to work on your “masterpeep” now! 8. 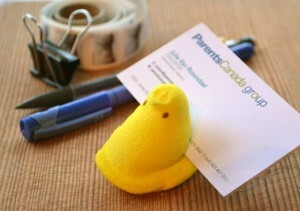 Check out other Peeps contests. There may be one in your area! 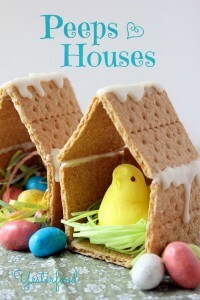 Details at the Peeps official website. 8. Peeps play dough. Yes, you can actually craft colorful play dough out of Peeps. 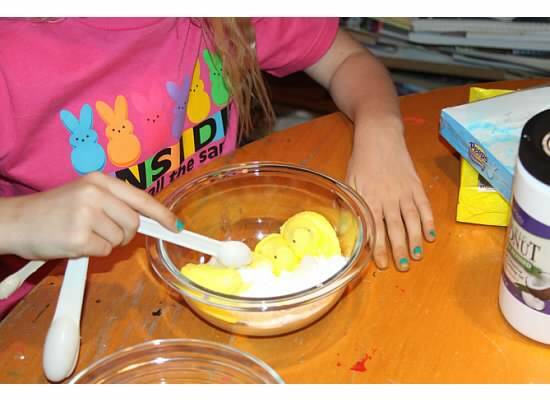 What you need: Peeps, corn starch, coconut oil and food coloring (optional). Find the instructions at Growing a Jeweled Rose. 9. Tasteful centerpieces. 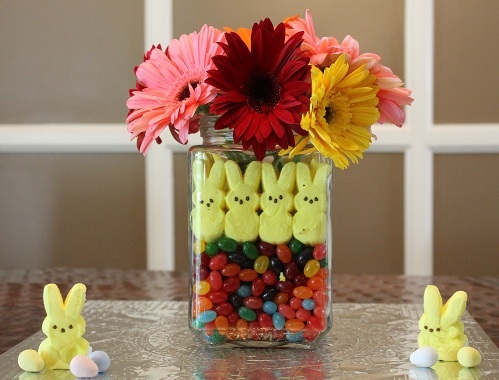 Brighten up your Easter dinner table with easy-to-make decorations that will surely be conversation starters. 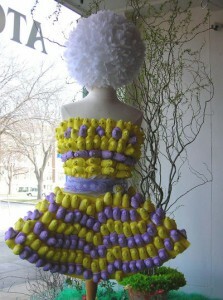 You can use bunnies or chicks or even the new egg-shaped confection that debuted this year. See Holidays Central for details. 10. Top a fruit cup parfait. Details on the Peeps website. 11. Chocolate-dipped Peeps and Bunnies. Roll in decorative holiday sprinkles when you’re done. See the Peeps website for more info. 12. String up a garland. In the “olden days,” people would string up popcorn or cranberries at Christmas time. 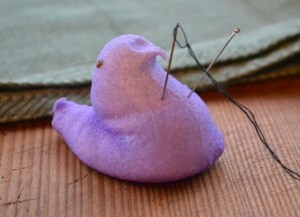 Well, we’re starting a new tradition – stringing up Peeps! 13. Bottle stopper. The humor site, Babble, (half-jokingly?) 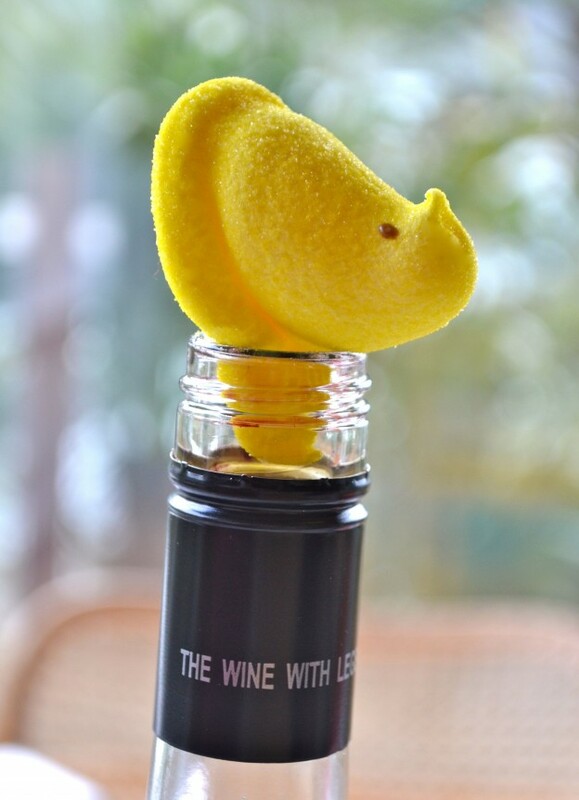 suggests using a leftover Peeps in place of a wine cork. Sure, why not? 14. Business card holder. Again from Babble. Looks like it works to us! 15. Pin cushion. Another humorous “invention” from Babble. 16. Table wedge. Again, from Babble. Okay, so these last few are more of a joke, but really, who’s to say? I know I’m trying the bottle stopper suggestion. 17. Cat toys. Let them dry out and soon you’ll find them batted under the cupboard, collecting dust along with the fuzzy mice. 18. Ant attractants. 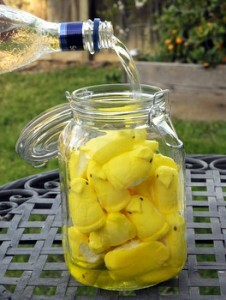 Why spend money on chemical-laden attractants for your ant traps when you can use chemical-laden Peeps? 19. Ornaments. 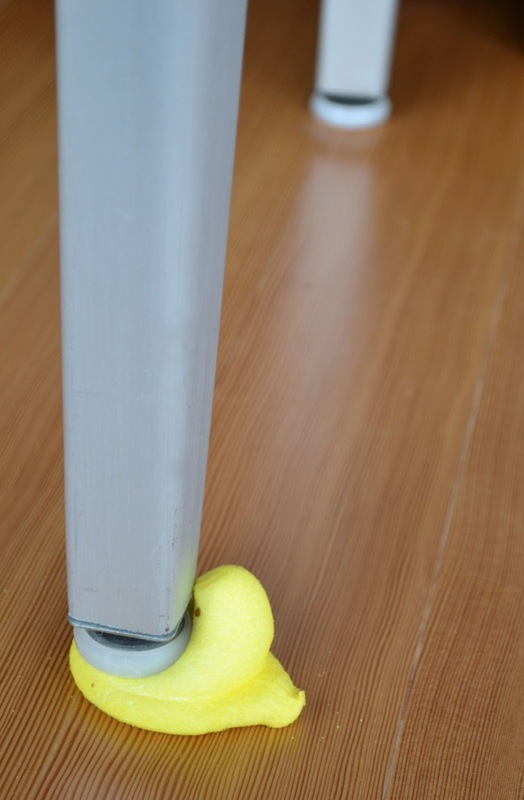 I have a girlfriend who spray-paints hardened Peeps, impales them with pipe cleaners for hanging and gifts them at Christmas time. We hang ours on the tree every year! 20. Buy 1/2 priced after Easter and save for next year. If they go stale, who will be able to tell? 21. Make into a lovely dress. Show Björk she’s not the only one who can wear a bird-themed dress. 22. Use for potty-training. Float a Peep in the toilet and instruct your toddler son to aim for it – sink that birdy! 25. Blow them up in the microwave. Because, you know, that’s just an Easter tradition. Babysitting Up to $13.44 an Hour…Is This Too Much?